I stumbled upon this fabulous little link up over the weekend and thought I had to join! I've been seriously slacking on my blog lately and with the end of the semester drawing nearer, I'm ready to get back on track. You've all followed me through this insane journey over the past four months; senior year has been kind to me but there have definitely been some bumps along the road. I'm ready to welcome December with open arms and see what the last month of 2013 has to offer. This link up is a promise to blog every day in December--let's see how well I could keep up with it. // End of the semester: As sad as I am to see my last Fall semester end, I'm ready to be done with my classes. // Christmas break: With the end of the semester means one, long month of doing absolutely nothing! I'm excited to sit on my couch, watch Christmas movies, read books and magazines and relax. //Santacon: Santacon is a huge thing, apparently. I thought it was only in NYC but it is surely not. Every December, people dress up as Christmas characters and head into Manhattan and other large cities across the globe and drink until it's Christmas time! Now that I'm 21 years old, I can participate!! It's supposed to be for charity, also. //Christmas: Aren't we all just waiting for Christmas to appear? I love the weeks leading up to the great holiday though. Christmas movies are my favorite and I love the snap of cold in the year right before December 25th. It's magical. //Manhattan: I'm planning on traveling to Manhattan quite a few times over break (we'll see if that happens) but there is nothing better than NYC at Christmastime. Rockefeller Center? Macy's? Broadway shows? Everything is utterly perfect about the city. //Royally Pink: I am about to show my corner of the Internet a lot more love. Maybe a new design? More giveaways and sponsored posts? I have big plans up my sleeve and I'm ready to dish them out over break! 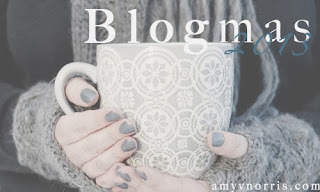 Thank you to Amy for putting this fabulous little Blogmas together!